"Falconiformes" redirects here. For the other birds of prey listed in the traditional order, see Accipitrimorphae. The falcons and caracaras are around 60 species of diurnal birds of prey that make up the family Falconidae. The family is divided into two subfamilies, Polyborinae, which includes the caracaras and forest falcons, and Falconinae, the falcons, kestrels and falconets (Microhierax and Spiziapteryx). They differ from the eagles of Accipitridae, in that falcons kill with their beaks instead of their taloned feet. They have a "tooth" on the side of their beak for this purpose. Falcons and caracaras are small to medium-sized birds of prey, ranging in size from the black-thighed falconet, which can weigh as little as 35 grams (1.2 oz), to the gyrfalcon, which can weigh as much as 1,735 grams (61.2 oz). They have strongly hooked bills, sharply curved talons and excellent eyesight. The plumage is usually composed of browns, whites, chestnut, black and grey, often with barring of patterning. There is little difference in the plumage of males and females, although a few species have some sexual dimorphism in boldness of plumage. Falcons and caracaras are carnivores, feeding on birds, small mammals including bats, reptiles, insects and carrion. In popular imagination the falconids are fast flying predators, and while this is true of the genus Falco and some falconets, other species, particularly the caracaras, are more sedentary in their feeding. The forest falcons of the Neotropics are generalist forest hunters. Several species, particularly the true falcons, will stash food supplies in caches. They are solitary hunters and pairs guard territories, although they may form large flocks during migration. Some species are specialists, such as the laughing falcon, which specialises in snakes, others are more generalist. The falcons and caracaras are generally solitary breeders, although around 10% of species are colonial, for example the red-footed falcon. They are monogamous, although some caracaras may also employ alloparenting strategies, where younger birds help adults (usually their parents) in raising the next brood of chicks. Nests are generally not built (except by the caracaras), but are co opted from other birds, for example pygmy falcons nest in the nests of weavers, or on the ledges on cliffs. Around 2–4 eggs are laid, and mostly incubated by the female. Incubation times vary from species to species and are correlated with body size, lasting 28 days in smaller species and up to 35 days in larger species. Chicks fledge after 28–49 days, again varying with size. Falcons and caracaras have a complicated relationship with humans. In ancient Egypt they were deified in the form of Horus, the sky and sun god who was the ancestor of the pharaohs. Caracaras also formed part of the legends of the Aztecs. Falcons were important in the (formerly often royal) sport of falconry. They have also been persecuted for their predation on game and farm animals, and that persecution has led to the extinction of at least one species, the Guadalupe caracara. Several insular species have declined dramatically, none more so than the Mauritius kestrel, which at one time numbered no more than four birds. Around five species of falcon are considered vulnerable to extinction by the IUCN, including the saker falcon. The family Falconidae was introduced by the English zoologist William Elford Leach in a guide to the contents of the British Museum published in 1820. Traditionally, the raptors were grouped into four families in the single order Falconiformes, but many thought this group to be paraphyletic and not to share a common ancestor to the exclusion of all other birds. First, multiple lines of evidence in the 1970s and 1980s suggested that the New World vultures Cathartidae were more closely related to storks and herons (Ciconiiformes), though more recent work places them outside that group as well. Consequently, New World vultures are now often raised to the rank of an independent order Cathartiformes not closely associated with either birds of prey or storks or herons. In 2007, the American Ornithologists' Union's North American checklist moved Cathartidae back into the lead position in Falconiformes, but with an asterisk that indicates it is a taxon "that is probably misplaced in the current phylogenetic listing but for which data indicating proper placement are not yet available". In Europe, it has become common to split the remaining raptors into two: the falcons and caracaras remain in the order Falconiformes (about 60 species in 4 groups), and the remaining 220-odd species (including the Accipitridae – eagles, hawks, Old World vultures, etc.) are put in the separate order Accipitriformes. An unplaced prehistoric family known only from fossils are the Horusornithidae. In agreement with the split of Falconiformes and Accipitriformes, comparative genome analysis published in 2008 suggested that falcons are more closely related to the parrots and passerines than to other birds including the Accipitridae, so that the traditional Falconiformes are polyphyletic even if the Cathartidae are excluded. Indeed, a 2011 analysis of transposable element insertions shared between the genomes of falcons, passerines, and parrots, but not present in the genomes of other birds, confirmed that falcons are a sister group of the combined parrot/passerine group, together forming the clade Eufalconimorphae. The clade Falconidae is composed of three main branches: the falconets and true falcons, the caracaras, and the forest falcons. Differences exist between authorities in how these are grouped into subfamilies. Also, the placement of the laughing falcon (Herpetotheres) and the spot-winged falconet (Spiziapteryx) varies. One common approach uses two subfamilies Polyborinae and Falconinae. The first contains the caracaras, forest falcons, and laughing falcon. All species in this group are native to the Americas. The composition of Falconidae is disputed, and Polyborninae is not featured in the American Ornithologists' Union checklists for North and South American birds that are produced by its Classification Committees (NACC and SACC). The Check-list of North American Birds considers the laughing falcon a true falcon (Falconinae) and replaces Polyborinae with Caracarinae and Micrasturinae. On the other hand, the Check-list of South American Birds classifies all caracaras as true falcons and puts the laughing falcon and forest falcons into the subfamily Herpetotherinae. Based on genetic research from the late 1990s to 2015, Boyd uses three subfamilies. He places the laughing falcon (Herpetotheres) with the forest falcons (Micrastur) into Herpetotherinae (similar to SACC). Caracarinae is separate (similar to NACC), but also contains the spot-winged falconet (Spiziapteryx). The other falcons are placed in Falconinae. 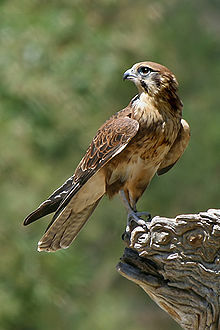 Falconinae, in its traditional classification, contains the falcons, falconets, and pygmy falcons. Depending on the authority, Falconinae may also include the caracaras and/or the laughing falcon. Boyd further divides the Falconinae into two tribes: Polyhieracini containing the Microhierax falconets, plus Falconini containing the Falco falcons. The pygmy falcon and the white-rumped (pygmy) falcon are split into separate genera (Polyhierax and Neohierax), with the former placed into Polyhieracini and the latter into Falconini. ^ Tordoff, Andrew (2002). "Raptor migration at Hoang Lien Nature Reserve, northern Vietnam" (PDF). Forktail. 18: 45–48. Archived from the original (PDF) on 2011-06-10. ^ Collopy, M.W. (1977). "Food Caching by Female American Kestrels in Winter". Condor. 79 (1): 63–68. doi:10.2307/1367531. JSTOR 1367531. ^ Ille, R.; Hoi, H.; Grinschgl, F.; Zink, F. (2002). "Paternity assurance in two species of colonially breeding falcon: the kestrel Falco tinnunculus and the red-footed falcon Falco vespertinus". Etologica. 10: 11–15. ^ Bock, Walter J. (1994). History and Nomenclature of Avian Family-Group Names. Bulletin of the American Museum of Natural History. Number 222. New York: American Museum of Natural History. p. 133. ^ e.g. Ericson et al., Diversification of Neoaves: integration of molecular sequence data and fossils, Biol Lett. 2007 Jun 22;3(3):257-9. ^ American Ornithologists' Union (2009) Check-list of North American Birds, Tinamiformes to Falconiformes 7th Edition. ^ Suh A, Paus M, Kiefmann M, et al. (2011). "Mesozoic retroposons reveal parrots as the closest living relatives of passerine birds". Nature Communications. 2 (8): 443–8. doi:10.1038/ncomms1448. PMC 3265382. PMID 21863010. ^ Myers, P. R.; C. S. Parr; T. Jones; G. S. Hammond; T. A. Dewey. "Subfamily Polyborinae (caracaras and forest falcons)". Animal Diversity Web. University of Michigan. Retrieved 2009-08-15. ^ "Check-list of North American Birds". North American Classification Committee. American Ornithologists' Union. Retrieved 2009-08-15. ^ a b "A classification of the bird species of South America". South American Classification Committee. American Ornithologists' Union. Archived from the original on August 1, 2009. Retrieved 2009-08-15. ^ a b Boyd, John H. "Falconiformes". Taxonomy in Flux Checklist. Retrieved 11 March 2016. ^ Myers, P. R.; C. S. Parr; T. Jones; G. S. Hammond; T. A. Dewey. "Subfamily Falconinae (falcons)". Animal Diversity Web. University of Michigan. Retrieved 2009-08-17. ^ "Check-list of North American Birds". North American Classification Committee. American Ornithologists' Union. Retrieved 2009-08-17. ^ PVPH 465: a phalanx 1 of the middle toe. A caracara? Possibly belongs in extant genus (Kramarz et al. 2005).